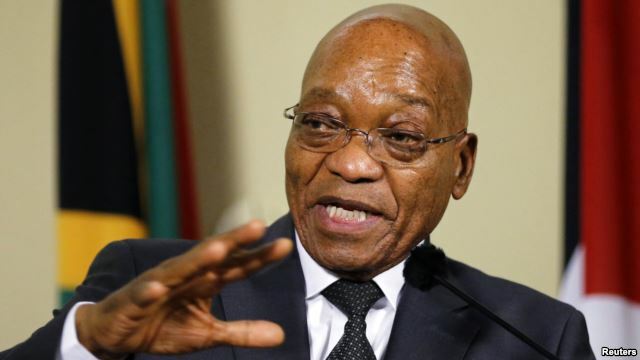 JOHANNESBURG — After a protracted silence, South African President Jacob Zuma publicly has condemned a rise in attacks on foreign nationals in two major cities. But critics point out that the leadership in the Rainbow Nation — including Zuma himself — has been less than welcoming to foreign residents, and that a war of words started this conflagration. And the perpetual thorn in Zuma’s side, opposition rabblerouser Julius Malema, says Zuma is to blame for the fact that South Africans increasingly see violence as the solution to their problems. Strong words from President Jacob Zuma before a nation in the throes of violence against African immigrants. In recent weeks, his nation has seen an upswing in attacks against foreign residents — particularly lower-income residents originally from Ethiopia, Malawi, Somalia and Zimbabwe. The violence started in the coastal city of Durban and then spread to the economic hub, Johannesburg. But Zuma’s words before parliament failed to satisfy his critics, who immediately pounced on him. Zuma’s biggest critic, far-left politician Julius Malema, delivered a rousing speech that highlighted — in more ways than one — that the president’s stoic, often stilted rhetoric is an impediment to his message. “Mr. President, you come here, you want to condemn violence against xenophobia. But the Cubans have taught us that body language speaks volumes than prepared speech,” he said. After all, it was a speech that may have sparked this latest round of xenophobic attacks. In late March, the king of the Zulu people, Goodwill Zwelithini, delivered a speech that many construed as being derisive of foreign residents. Zuma’s son later publicly supported and added to the king’s sentiments, adding fuel to the fire. The king claims his words were poorly translated from isiZulu and that he was misinterpreted. He now faces a charge of hate speech. Activist Tim Flack this week laid a complaint against the king. Flack’s day job is as an organizer for the South African National Defense Union, but he says he laid the hate speech charge in his personal capacity. He says that hate speech is imbedded in South African society. More worrying, Malema says, is the tendency of South Africa’s leadership to react violently — as an example, he mentioned the 2012 mineworkers’ strike in the town of Marikana that led police to shoot dead 34 protesters. Malema put the blame for this squarely on Zuma. This is not the South Africa that many people hoped for in 1994, when the nation ended its racist regime and dubbed itself the inclusive Rainbow Nation. And it’s not the nation that so many immigrants — from Africa and beyond — flocked to in search of a new life and better opportunities. This, in the words of former President Nelson Mandela, is what that nation was about. “Let be justice for all. Let there be peace for all. The sun shall never set on so glorious a human achievement. Let freedom reign. I thank you,” Mandela said.